My mom came to our house this weekend. She's getting older, and doesn't visit as much as she used to. My sister was here, too, with my cutie-pie niece. The kids love it: Max has a special squeal for when Babba walks in the front door. Sabrina, who can be a bit blasé, gets very cuddly with her. Me? I just feel happy and...comforted. There is nothing like having my mommy around. And I do not feel the least bit too old to say that. Nobody but my Mom asks me if I'd like a piece of fruit to eat (sure!) . Nobody but my mom asks if I'm overly stressed and whether I need a break from work (nope). Nobody but Mom tells me my skin looks as good as it ever did. "Now what did Marilyn call it? Porcelain!" she'll say, and I'll beam. (For the record, her eyesight is perfectly fine.) Nobody but Mom says "Do you have enough Tampax? Would you like me to buy you some? They are on sale this week!" I mean, who in the world cares enough about me to ask that? Mom. Whenever she comes over, she usually brings some sort of memorabilia. This time, she had a birthday card I sent her in my early 20s whose cover said, "Mom, do you remember when I was a kid and I listened to you all the time?" And when you opened it the inside read, "Me, either." And we both cackled. My mom waters my plants. She cleans up the crumbs on the kitchen counter. She watches HGTV with me and marvels over the home renovations. She sits and gazes at me adoringly and tells me how awesome the kids are. She sprinkles her magic Babba dust all over our house, and I am under her spell. And suddenly, I am a kid again without a care in the world. I know, I am seriously aware of just how precious this time with my mom is. We had a great visit! Sweet! My mom has all of my old cards too! I know just what you mean. I feel so lucky that my mom is the same way. She brings over 20 rolls of toilet paper, cleans my stove, because she know there's no time for that takes me to lunch, and gives me a trinket of my grandmother's. It's nice to have someone who just knows what you need and gives you tlc. I think your mom and my mom went to the same Mom School, Jackie. And she didn't even ask me why I wasn't wearing any makeup! It's reading about moms like yours that makes me aspire to be that kind of mom to my kids. Thanks for sharing this. Oh, I don't even go there, Hannah. My mom is so uber-nurturing I could never reach that level. We are different kinds of moms! I used to see my mom at least twice per week - dinner out on Wednesday & Sunday afternoons to browse stores & get a snack of cheese fries or pastry & coffee. After he was born & I was back at work, I used to see both my parents 3 or 4 days per week, albeit briefly, while I dropped my son off & chit-chatted for a bit before going to work. But since I started working traditional hours, I rarely see either of my parents. It's also hard to talk on the phone with them, as when my son is awake, the phone is his signal to get loud & needy - when he's asleep, the only way to talk on the phone is in the (unheated) bathroom w/ the door closed or outside. But my mom is my best friend - and not in one of those she let me get away with murder best friend moms. She's just my confidante, my comfort, my person who I always call when something big happens, good or bad. Jenny, it sounds like you need to carve out more Mom time! That's so sweet! You and your kids are so lucky to have her in your lives. My mom passed away in December 2006, and I still miss her every day. 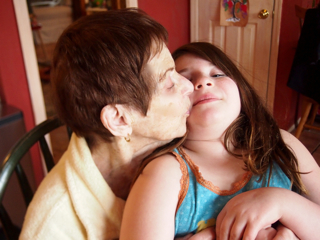 She lived to see her first granddaughters (after six grandsons) born, and I'm glad I could give her that. She was very involved in my nephews' lives, but by the time the girls were born she was very sick, and it pained her that she couldn't help out, but we spent as much time with her as we could, and she reveled in them. My daughter Joanna is so much like her; I see my mom in her face every day! That's beautiful that you see her in Joanna, Helena. I love that. Max has some of my mom in him. What a beautiful tribute to Mommy. I always say that no one will ever worry about me or care about me the way Mommy does - she is one of a kind. I am so glad we were able to make the visit happen - it meant as much to her as it did to you and the kids. I love having you over too! But you don't bring me Tampax. This post made me a bit teary. You are very fortunate to have a mom you are so close to. I love this post, Ellen. It made me smile the whole way through even with tears in my eyes. Beautiful. I live with mine and could not live without her! Aww so sweet! I should show my mom more appreciation you inspire me to be a better daughter. Special Needs Blogger Weekend Link-Up: Post it!